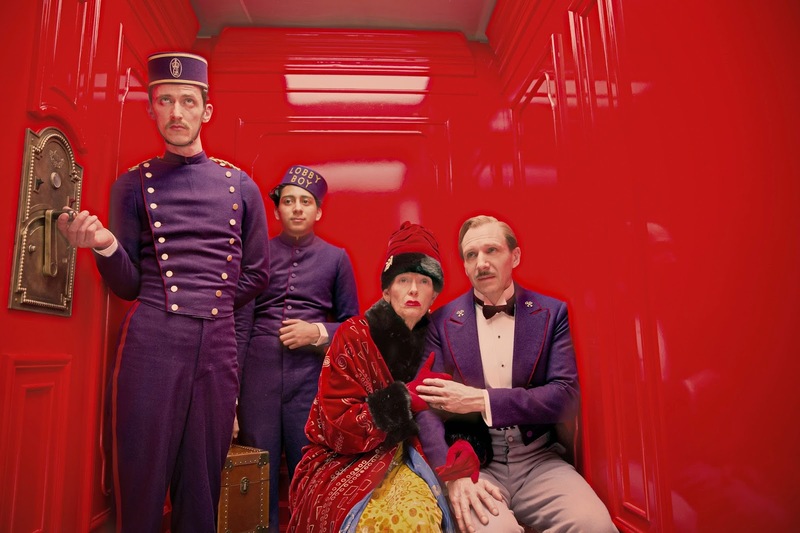 A quirky comedy with a mystical visual style, The Grand Budapest Hotel celebrates the faded glories of the past through a warped satirical lens. After several quick flashbacks within flashbacks, it's the late 1960s and the unidentified Author as a Young Man (Jude Law) is seeking inspiration by spending time at the picturesque mountaintop Grand Budapest Hotel, now well past its best days, in the mythical country of Zubrowka. He meets the legendary owner of the hotel Zero Moustafa (F. Murray Abraham), and over dinner the elderly Moustafa recounts the story of how he came to own the hotel. The main story is set in the 1930's with the hotel in its prime. The young Zero (Tony Revolori) secures a job as a lobby boy, and the hotel's concierge Monsieur Gustave H. (Ralph Fiennes) takes Zero under his wing. Gustave effectively runs every detail of the hotel's operation. He also looks after the sexual and emotional satisfaction of many rich and elderly women who come to the hotel specifically to seek Gustave's services, including Madame Céline Villeneuve Desgoffe-und-Taxis, or Madame D. for short (Tilda Swinton). The only contact with the hotel's reclusive owner is through a lawyer known as Deputy Vilmos Kovacs (Jeff Goldblum). With the winds of war blowing through Zubrowska, grim faced soldiers, including a group led by Inspector Henckels (Edward Norton), begin to stomp their authority through the land, and the era of luxurious living starts to draw to a close. Madame D. mysteriously dies, and her complicated will assigns to Gustave the precious painting Boy With Apple, much to the surprise and disgust of her son Dmitri (Adrien Brody). Gustave finds himself accused of murder and imprisoned, and it's up to Zero and his girlfriend Agatha (Saoirse Ronan) to help Gustave escape and avoid Dmitri's savage assassin J.G. Jopling (Willem Dafoe). A madcap chase across the mountains ends back at the hotel, where Zero's destiny will be decided. Director Wes Anderson adopts a purely whimsical style, and recounts the story with an exaggerated flair that mimics animation's acute symmetry. The film often looks like a hand-drawn fairytale for adults, with the hotel as the centrepiece awash in vivid reds, purples and yellows, but almost every other location, from Madame D.'s mansion to a remote monastery, is staged with bombast. Anderson populates his vision with a pretty wild array of characters, almost every role (including some extras) occupied by a star, and all the performers given free reign to rise to the fustian surroundings. Other than Gustave, there is no attempt to convey nuance. Norton, Brody and Dafoe jump at the screen with inflated menace, while Revolori and Ronan are wide-eyed and fairly quiet pure goodness. Harvey Keitel, Bill Murray, Owen Wilson, Tom Wilkinson and Bob Balaban are among those who make brief appearances. Ralph Fiennes as Gustave does the heavy lifting, representing the essence of a fading era and his general disgust at the changing times. Anderson gives his unlikely hero a progressive shine in his kind treatment of the immigrant outsider Zero, but otherwise Gustave represents a societal class that will not survive what looks like a fascist takeover of the country, where the hotel's opulence will be subverted by the state's heavy boot. Fiennes gives a spirited performance, brushing against the film's extravagance but keeping Gustave as the most relatable member of a dimming era. The sprawling story takes a backseat to the nostalgic theme of beautiful times coming to an end. With the abundant acting talent at his disposal, Anderson weaves a complex narrative that is frequently witty with lament, but that also sometimes slips into the unnecessarily ridiculous. It's a fine balance to bemoan bygone times with clever wit, and episodes of wild chases down mountain slopes disrupt the film's generally tender tone. 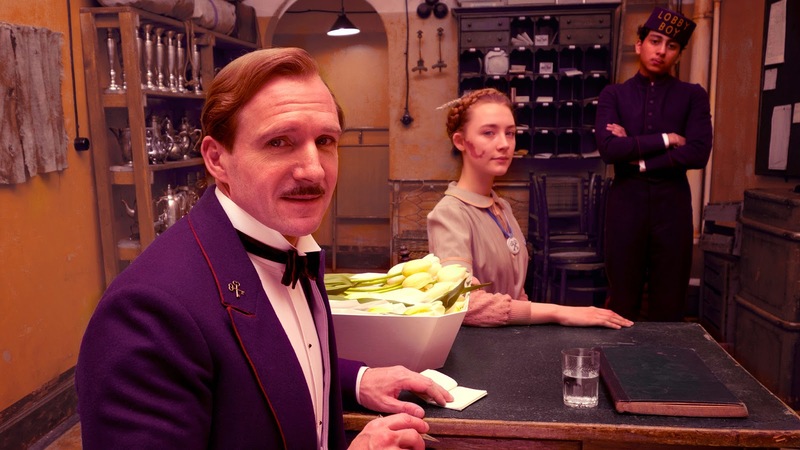 The Grand Budapest Hotel may be a bit too unwieldy to allow every corner to remain exquisitely maintained, but it is definitely worth a stay.